Families eventually do have a monthly surplus, see their savings start to grow, consolidate their debt, set aside discretionary funds and personal allowances, build their wealth and become more aware of their pro-active involvement and responsibility regarding their lives and finances. This is when excitement builds and fundamental thought patters as well as spending attitudes are changed. Budgeting is seen as an accurate measurement of success when significant behavioral transformation is taking place on the landscape of the family budget, spending habits and financial patterns we observe over time! Do you ever feel that you do not have enough cash at the end of the month to pay bills, buy necessities of life? Are you barely making a dent in your credit card debt balance, no matter how hard you try? Here is a reality check for all of us: if we choose to spend it, it is gone for good. We cannot spend it on anything else. Are you perhaps worried about a nest egg for your golden years or savings for early retirement? 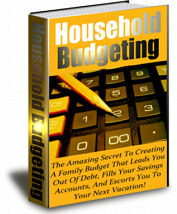 Then you have arrived at a source that can provide some prudent tips on how to start, finish, implement, stick to, revise and refine a family budget. The family budget is a dynamic process, even more so than a mere static work-product, result, process-outcome or document. It will, can and should change over time. It becomes a barometer of a family’s fiscal circumstance, resources and health.